Tour de Sabor Recently updated ! Pump up your tires because the first annual Tour de Sabor is happening this spring….and you are invited! Can you bike 20 miles on tacos alone? Well there is only one way to find out. Guided ride begins at Common Market in Plaza Midwood at 2 pm on Sunday, May 19th. Participants will receive their punch card and Tour de Sabor water bottle starting at 1:30 and guided ride rolls out at 2. Speed will average 11-13 miles per hour. If you are rolling with your friends or want to rip a speed record on the 20 mile route as fast as possible, here it is to upload on your phone. The Tour de Sabor is our way of celebrating Charlotte and letting you know that we love it when you ride your bike to our restaurants…once a day, once a month or all year long. Bike for tacos people! A Bicycle Benefits sticker that gives them everyday discounts at Sabor and 175 locations around the city when they bike there and show the program helmet sticker. 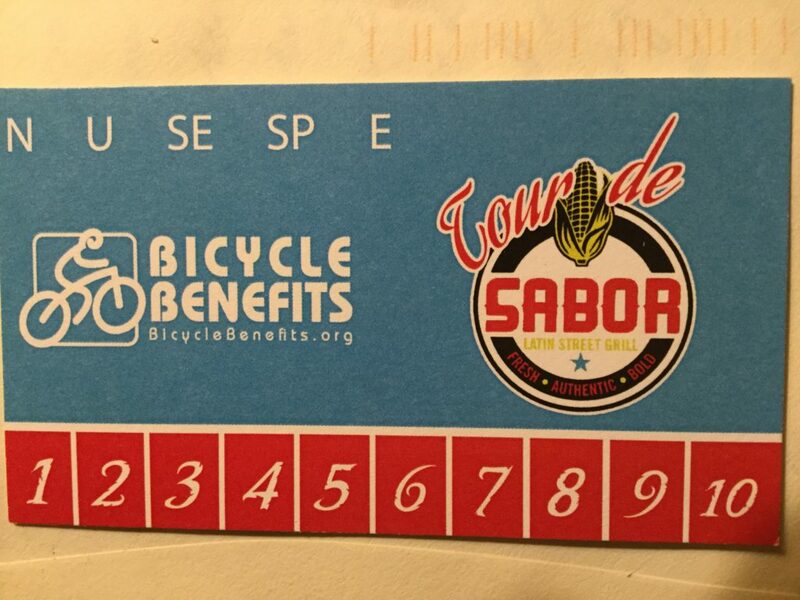 A punch card which will give participants up to 10 tacos total at the 5 participating locations during the ride. Other purchases are up to the riders and will receive their customary 10% off Bike Benefits offer. Churros for all participants and raffle prizes at the end of the ride. (Elizabeth location) Don’t lose your punch card because you’ll need it at the end to win prizes. Raffle will be at 6 pm.